I have two stories to tell you. The truth probably lies somewhere in between. Story one: My mother was in the Strip District in Pittsburgh and saw a Guittard Chocolate Cookbook. Missing her eldest daughter and knowing that book is something which will make her smile, buys it for me. Story two: My mother was in the Strip District in Pittsburgh and saw a Guittard Chocolate Cookbook. Looking through it she saw some recipes which looked delicious but she knew there was no way she would ever make them for herself. However, if she bought it for her daughter she could get the daughter to make the desserts and she would get all the deliciousness with none of the work. Somewhere in these two stories lies the truth… but either way my mother bought me the Guittard Chocolate Cookbook and I promptly decided I needed to to bake something. Looking at what I had in my kitchen (and oddly having someone who like peanut butter cookies in my house!) I decided to make the Chocolate Thumbprint Peanut Butter Cookies. I very rarely get to make peanut butter cookies because my husband doesn’t like them and due to peanut allergies I can’t take them to work. But I really enjoy peanut butter cookies – and adding chocolate.. well… that just makes it the best! Black and White cookies seem to be one of those quintessential New York desserts, much like Babka. I had never heard of them before I started dating my husband and I can honestly say I have never seen someone love them as much as my brother-in-law. He came to visit last weekend for the Fourth of July and I decided this would be a good time to try this soft and cakey cookie. While mine came out a little too poofy they were still delicious and they taste pretty close to what you would find in bakeries and delis all over New York City. When I made the banana pudding a few weeks ago I mentioned I was going to have a lip biopsy done… well it happened and went very well. However my bottom lip is now twice its normal size and I need soft easy-to-eat foods. Plus something inherently comforting sounds nice as well. And there are few things more comforting than a delicious bowl of rich, chocolate pudding. This pudding is perfect: intensely chocolatey, smooth, creamy, and easy to make. If you are not an intense chocolate person I don’t see why you couldn’t substitute 6 ounces of milk chocolate chips, or butterscotch, or even peanut butter chips if you liked. Last Monday was icy. It started as one of those days when the snow is just barely snow because the temperature is not really below freezing but then the temperature dropped. And all that nice slushy snow/not snow muck froze. And then it began to ice storm. We didn’t go out Monday or until noon the following Tuesday. So I decided I should try baking a cake. Well I was pretty confident on the cake front, I decided I would try making butter cream again. Also we weren’t going out in the ice and I didn’t have any icing on hand and I wanted to make some cake! Happily this was delicious very successful buttercream, if I do say so myself. The cake was pretty amazingly delicious too. And the perfect thing to make you not care about the dreary gray winter days outside. My little sister’s drink of choice for awhile was the amaretto sour, so I have had a half-used bottle of Disaronno sitting in my cabinet for a good year or so. It’s not my favorite. Too sweet for me. Thus I have been actively looking for ways to use it up and when I saw this fudge I couldn’t resist. I realize criticizing an amaretto sour for being too sweet and then being a little rhapsodic about amaretto fudge seems a little…. odd. But hey, you expect fudge to be sweet. And this fudge is so so easy! Just four ingredients which you basically just melt together! That’s it. Delicious and simple! Though, if I make it again I will change things up a bit. I think I would add marshmallow creme. This fudge came out a little soft for my taste, I want it more structured. And the flavor is crying out for something cherry to me. Dried cherries, maraschino cherries drained and chopped… stay tuned, I will probably repost a version that will be completely complicated and lose all of the beautiful quick simplicity of the recipe below. Sigh, I just can’t leave things alone. So here is the original, simplest, and quite possibly best version of chocolate amaretto fudge. Tuesday was my birthday. I am still not in possession of the largest appetite in the world so I skipped the traditional cake and ice cream Tuesday night. But my husband is taking his mother out for Mother’s Day this weekend and I figured, since we will have family visiting from out of town, I might as well make myself the cake I would have made on Tuesday. Since there will be people to share it with. Though once I tried this cake I was a little less sold on the sharing idea. It is delicious! Fudgey, rich, moist, chocolatey and spiced heaven on a fork. The mascarpone whipped cream topping is completely optional; the cake would be fantastic with just some powdered sugar dusted on top, but I really enjoyed the clean cool sweet of the topping with the chocolatey spice of the cake. You can’t say I didn’t warn you. I told you that I would find a St. Patrick’s Day Chocolate Chip Cookie recipe and that is just what I did! Is that a problem? And yes, I did buy a big bag of M&Ms and pick out all of the green ones. What else was a girl to do? My local grocery store doesn’t have one of those select your color M&M dispensers and I was not going either to drive all over town or to wait for them to be shipped to me. 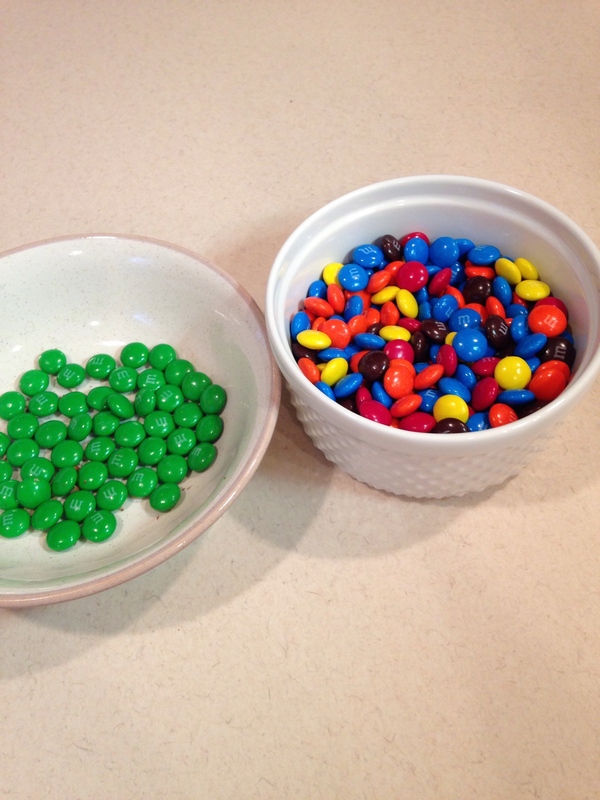 Plus is having a bowl of extra M&Ms around the house really a bad thing? I don’t think so! These are a form of the pudding chocolate chip cookies I keep seeing all over the internet. And the pistachio flavor is mild but really nice with the dark chocolate. I am now thinking of other combinations which might be delicious (double chocolate, caramel and chocolate, Gingerbread, french vanilla… mmmm I might be hitting up my pudding aisle a lot). Feel free to use regular semisweet chips if you prefer!